We’ve created some spreads to help you think of the future and make your plan for the planet. Like with all resolutions, it can be hard to keep on top of how well your efforts are working, so we are here to help you live your best eco life. 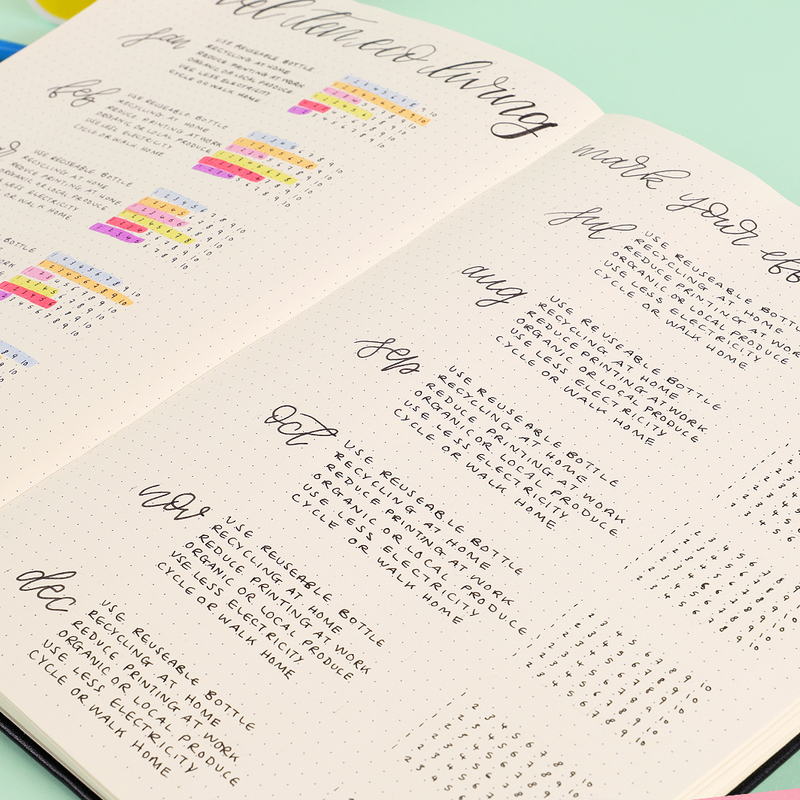 Split your page into the 12 months and leave room for 6 goals that you’d like to achieve throughout the year. Label each goal from 1 – 10. Staying true to your word when it comes to resolutions is much easier if you choose specific things you want to achieve and give them an action. Using this spread will help you make sure you complete your self-set goals and you’ll be able to see very clearly how well you’re doing. We’ve allocated each task a colour and will grade how well we are doing throughout each month. Hopefully, as the habits become fully established, we will be able to complete these goals consistently. Even if you set your sustainability goals now, you don’t have to be perfect straight away, you can just pledge to be better! 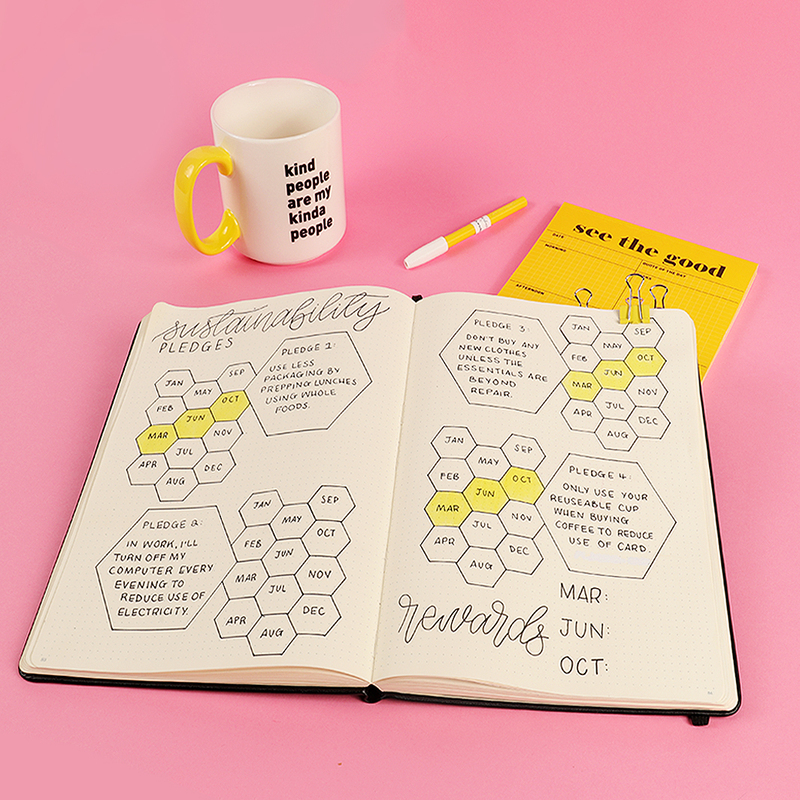 This honeycomb style spread has room for 4 sustainability pledges that you can complete throughout the year. Just write your pledge in the biggest box, then allocate different colours to represent how well you’re doing. Shop the conscious living collection here.